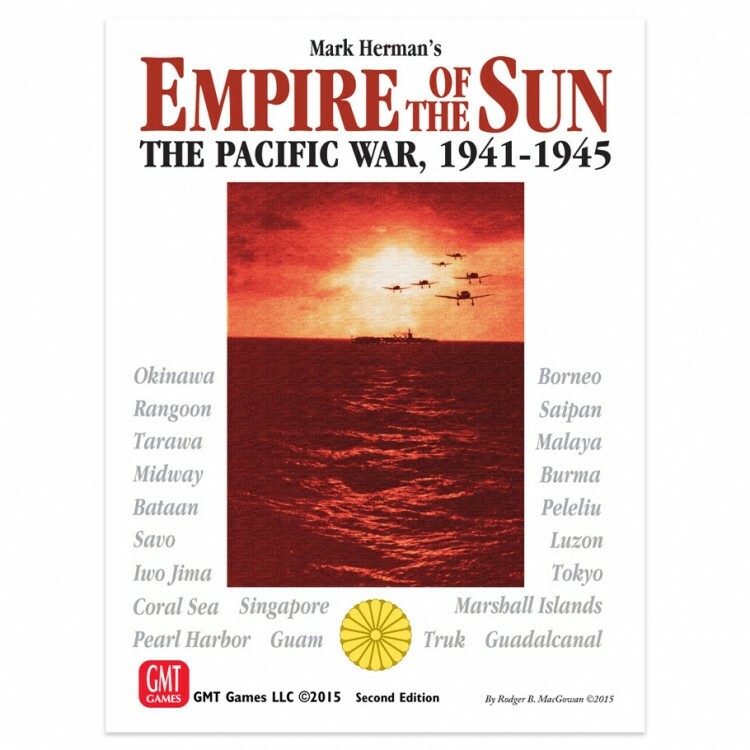 Empire of the SunGMT GamesEmpire of the Sun (EOTS) is Mark Herman's third card-driven design since he introduced the system to the hobby in We The People. EOTS is a strategic level look at the entire War in the Pacific from the attack on Pearl Harbor until the surrender of Japan. EOTS is the first card-driven game (CDG) to move the systemcloser to a classic hexagon wargame, while retaining all of the tension and uncertainty people havecome to expect from a CDG. Players are cast in the role of Macarthur, Yamamoto, Nimitz, and Mountbatten as you direct your forces across the breadth of the globe from India to Hawaii and from Alaska to Australia. This is represented on a single map based on a 1942 equal area projection of the entire theater of conflict. As in other games in theHerman CDG system, players try to maximize the impact of their cards even as they hide their intentions and traps from their opponent. The player is faced with a wide set of clear strategic choices. Should you play the card for its event that causesenemy inter-service rivalry hampering their operations, cause an enemy reverse in Europe delaying or accelerating Allied reinforcements, gain critical reinforcements, such as the elite Tainan Air Unit of Saburo Sakai fame, or launch an offensive to conquer a key objective. Offensives allow players to pit historical land, air and sea units against their opponent's forces.The focus of EOTS is ondirecting major offensive axes of advance. The Japanese early in the game are challenged to achievetheir historical expansion as Allied forces battle the clock to react with their in-place forces trying to achieve maximum damage to the hard- to-replace Japanese veteran units. EOTS places in the hands of the Japanese the full range of strategic options for taking the paths not taken historically as they try and manipulate the War in Europe and U.S. inter-service rivalry to divert and slow United States industrial output.Combat in EOTS is based on successfully bringing superior combined land, air, and sea forces to bear in a two-tiered combat system. The first tier is the resolution of air-naval combat where air superiority is the critical variable. The second tier of the system covers ground combat, where air power, naval bombardment,and armor give critical support. The culmination of both tiers results in one side prevailing in battle.The key variable in determining strategic victory is the level of U.S. political will. The Japanese win the game by forcing the U.S. into a negotiated peace, which was not achieved historically. The delivery of the A-bomb on its historical schedule is not a guarantee, often necessitating Operation Olympic and the invasion of Japan. It is often in its darkest hour that the Japanese find victory in EOTS.